As with most years at the California Spring Trials, there are a number of new petunias growers can explore. 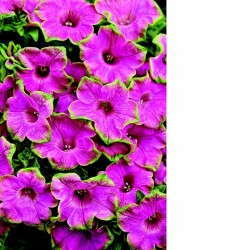 1) Ball Seed’s Pretty petunias, developed for less plant growth regular use, are among this year’s introductions. Suitable for cold-growing regimes, Pretty petunias are worth a look because of their better branching habit, which improves airflow and minimizes the chance for disease. And less disease, obviously, means less dump and more profits for growers. 2) Suntory Flowers also has a petunia introduction in its Summer Double Surfinias. Summer Doubles were developed for great heat and rain tolerance. They flower early for a double petunia and bloom even in small pots. These petunias have a tight, mounding shape with many branches, and they’re uniform across the colors. Flowers reportedly remain stable, even in 90-degree heat. 3) If you’re looking for a more miniature petunia series, Syngenta Flowers’ Picobella Cascades are worth a look. These miniature trailers are for hanging baskets, mixed containers, pots and jumbo packs. Early flowering in this series offers the opportunity for an earlier spring selling season. Picobella Cascade has a tightly branched, cascading habit that reduces the need for plant growth regulators, and the series comes in several colors, including: Coral, Lavender, Pink Glo, Red, Salmon, White, and Mix. 4) The new petunia introductions continue with American Takii’s Trilogy series. Takii says it focused on performance in every lifecycle stage of the plant as it developed the Trilogies, and it’s bringing the new series to market in seven colors that require fewer PGRs and a longer-lasting performance at retail. 5) Growers who were enthusiastic about Proven Winners’ ‘Pretty Much Picasso’ introduction a few years back should be excited about ‘Picasso in Pink,’ which sports clear pink flowers with a bright green edge. This variety is more compact and less vigorous than ‘Pretty Much Picasso,’ and it exhibits the same heat and humidity tolerance as the other Supertunias. Try it in 4 ½-inch pots, gallons and baskets. 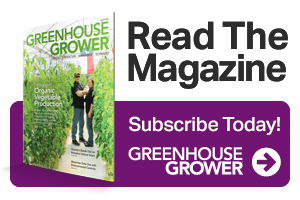 Kevin Yanik is the former managing editor of Greenhouse Grower. See all author stories here.